So I am a space nerd. I mean I read space.com daily and weekly am surfing Wikipedia for explanations about physics concepts I have no business reading. I owned and watched the documentary Moon Shot over thirty times as an eleven year old. I shed tears when Alan Shepard died. Star Trek is a thing for me (don't mention Into Darkness). I want nothing more than for the US Government to hand NASA the keys to the Treasury so we can go to Mars, like, tomorrow. Why has no one built a real Millennium Falcon? What are we doing with our lives? If I was given the chance to go to space, I would take it. So obviously I should like Gravity, right? Not so fast. First, and I'll keep this as spoiler free as possible, if this movie is real life, Sandra Bullock is dead after the first exciting incident. Period. Then things only get crazier. I'm sorry, and I know it's a movie, but if you're going to promote your film for its scientific accuracy, then I can be all hands aboard the neck-beard ship. Don't get me wrong, the action makes for compelling drama and absolutely amazing visuals, but it could not happen. But those visuals. Here they got it right. I have never been to space. 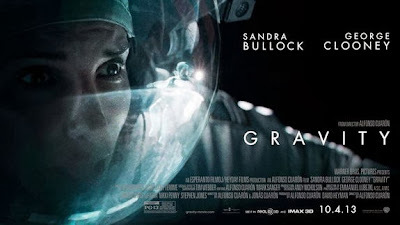 I also generally hate floaty/shaky cameras, but in Gravity, they are used to make you feel like you're floating along side the actors and it works perfectly. The Wife commented several times how much she needed to vomit. Sidebar, when I go to space, she plans to stay home. And as much as it pains me to say, the 3D effects were also some of the best I have seen, despite the headache I suffered after. But the center piece to all this was the earth. Always there, always visible, always gorgeous. I could not tell if/when they used CGI versus real photography from satellites and that is about the biggest complement I can give. The acting is meh. It's Sandra Bullock and George Clooney doing their thing. Par, passable, believable, not stunning or Oscar worthy. Also, under those spacesuits they wear a Liquid Cooling and Ventilation Garment, not a tank top and tight bun-huggers. Sorry, did I nerd out again? Anyways, the story is thoughtful and packs some decent impact and character development (even if very compressed). But honestly the analogy at the end is overtly obvious and once again screws with the science aspect of the film (I'll comment below on what this is, so not to spoil it here). Gravity is a good film, not a great one. It's kind of like a supermodel who passed two years of college before dropping out; she has some brains, but it's still probably best if she leans on her looks to get through life. Thanks for the review, I really don't think this movie is going to pop to the top of my Must Watch list. PS: Love the model analogy.